Renal pelvis dissection is easy if there are no adhesions or inflammation, otherwise hook electrode or endoscissors are used to take down this fibrous tissue. 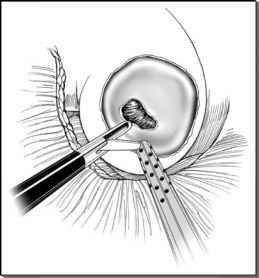 Care should be taken to perform gentle handling of the renal pelvis to prevent dislodgement of the calculus in to the intrarenal calyces. Dissection close to renal pelvis helps in avoiding inadvertent injury to posterior segmental branch of renal artery or any aberrant vessel. Usually, the large stone can be felt (some degree of tactile sensation). If the pelvis is intrarenal, further dissection of peripelvic fibrofatty and fascial tissue is required to expose the renal sinus with the help of grasping forceps and hook electrode. The right angle forceps or blunt spatula can be used to create the avascular space around the pelvis within the renal sinus.